Omnitrope is a synthetic version of human growth hormone (HGH) known as somatropin. It is administered through injection either into the muscle or under the skin. It is used to stimulate growth in children and adults who have conditions that prevent the pituitary gland from producing an adequate amount of natural growth hormone. Omnitrope was developed in response to growing public demand for a more affordable human growth hormone therapy medications. It is produced in Austria by the biopharmaceutical company Sandoz. As a generic alternative to other somatropin rDNA origin injection medications, it provides the same clinically-tested benefits as much more expensive versions of the same medication. Omnitrope is taken as a weekly dose that should be spread out over 6 or 7 days. 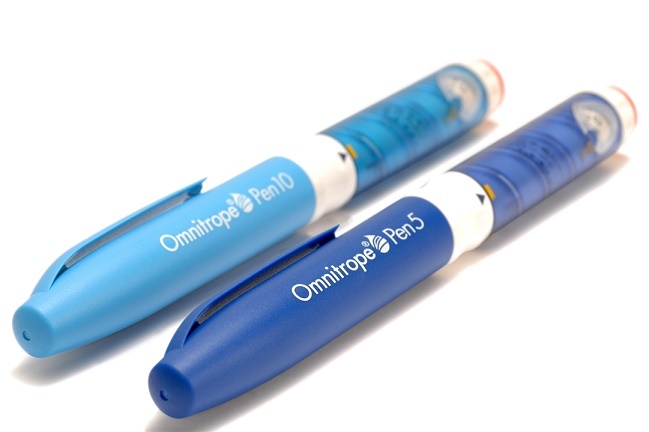 Omnitrope may come in cartridge form that can be loaded into a corresponding Omnitrope pen, or it may be prescribed for injection via a vial. Each pen or vial will come with a set of instructions that should be read thoroughly and followed precisely. The medication should always be visually inspected prior to use for particulate matter or discoloration. If either is present, then the medication should not be used. For adult patients, Omnitrope is sometimes given by weight-based dosing that may or may not be increased at 4 to 8 week intervals depending on patient response. Some doctors may choose to give a starting dose without taking weight into consideration. Depending on testing and response to this dose, the dosage may be increased at 4 to 8 week intervals as well. Again, this is to be done under physician guidelines. Older patients and those who are obese may be more susceptible to the adverse effects of somatropin and may have a lower starting dose than other adults. Women who are estrogen-replete or are taking oral estrogen may need a higher dosage than men. Overdosage of Omnitrope may lead to hypoglycemia or hyperglycemia and fluid retention. Long-term overdosage may lead to symptoms of gigantism and other known effects of excessive human growth hormone. Mild side effects associated with Omnitrope include reactions at the injection site such as bruising, pain, or swelling, swelling of the arms or legs, joint or muscle pain, stiffness in the hands or feet, and numbness. While these side effects are typical, patients should inform their doctor if any are worrying or if any of these symptoms get worse over time. The following severe side effects should be reported to a doctor as soon as possible: reoccurring headaches, blurred vision, nausea and/or vomiting, increased thirst or urination, increased tiredness or weakness, changes to appetite, or severe pain in the hip or knee. In rare cases, the following severe adverse reactions have been reported with clinical use of Omnitrope: glucose intolerance which may lead to overt diabetes, diabetic retinopathy, intracranial hypertension, intracranial tumors in patients that have been previously treated with radiation, progression of preexisting scoliosis, pancreatitis, problems with the femoral epiphysis in pediatric patients, severe fluid retention, hypothyroidism, and sudden death in patients with Prader-Willi Syndrome with certain risk factors such as obesity and respiratory disorders. Omnitrope may also have an atypical reaction when taken alongside other types of medications. This includes individuals who are taking insulin or other medications to treat diabetes. The prescribing physician should be made aware of any and all medications the patient is taking before beginning somatropin therapy. All of these potential risk factors should be discussed with a physician prior to starting Omnitrope.